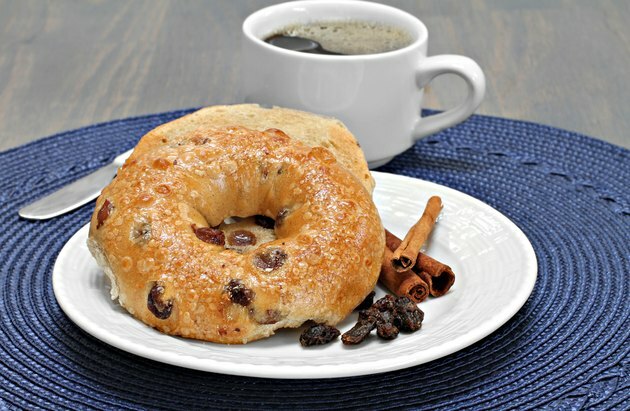 What Are the Health Benefits of Cinnamon Raisin Bagels? If you're looking for a convenient breakfast on the run, it's hard to beat a bagel -- just slap on some peanut butter, or add a few veggies, and go. Cinnamon raisin bagels aren't your best choice for healthy bagels, because they're made with refined grain flour, instead of healthier flour made from whole grains. However, they do have some nutritional value and you can consume them in moderation in a balanced diet. Cinnamon raisin bagels provide you with energy in the form of carbohydrates. Each large bagel contains 72 grams of total carbohydrates, including 3 grams of dietary fiber. During digestion, your body breaks down most of these carbs into simple sugars, such as glucose, and then utilizes the glucose as a source of fuel for your brain, muscles and other tissues. Carbohydrates also offer other physiological benefits -- they aid with fat metabolism, and prevent your body from breaking down protein to use as an alternate source of energy. The fiber in cinnamon raisin bagels also proves beneficial in lowering your cholesterol and fighting constipation. Each large bagel provides approximately 12 percent of the daily fiber intake for women and 8 percent for men, as set by the Food and Nutrition Board. Add cinnamon raisin bagels to your diet as an excellent source of selenium and iron. Each large bagel offers 41 micrograms of selenium, or three-quarters of the recommended daily intake, as set by the Food and Nutrition Board. It also contains 5 milligrams of iron -- 28 and 63 percent of the daily recommended iron intakes for women and men, respectively. Selenium and iron both allow your immune system to function properly, and help keep you free of infection. Selenium also supports thyroid gland function, while iron helps your body make functional hemoglobin, a protein needed for oxygen transport. Cinnamon raisin bagels offer health benefits due to their content of B-complex vitamins. Collectively, the eight B-complex vitamins help your body convert carbohydrates into fuel, support red blood cell function and keep your skin looking its best. These bagels are especially rich in niacin -- a vitamin that supports enzyme function and regulates your appetite -- as well as folic acid, a nutrient that reduces your risk of cardiovascular disease. Each large bagel contains 4 milligrams of niacin -- one-quarter of the recommended daily intake for men and 29 percent for women -- as well as 57 percent of your daily folic acid requirements, as set by the Food and Nutrition Board. Watch your portion size when you consume cinnamon raisin bagels. Combining a bagel with rich toppings, such as cream cheese, can quickly add up in calories. For example, a large cinnamon raisin bagel topped with 2 tablespoons of cream cheese approaches 500 calories. Instead, load up your bagel with lighter fare, such as spinach and sliced tomatoes, to limit your calorie intake while also boosting your nutrient content. Alternatively, consider eating just one half of a bagel at a time, and round out the rest of your meal with an ounce of nuts or a piece of fruit.